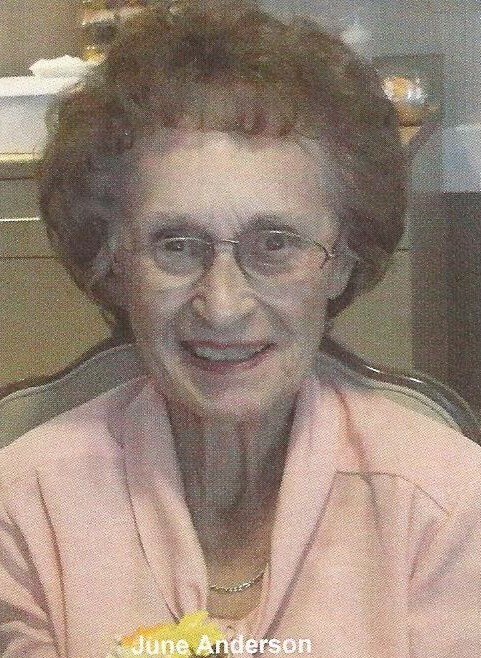 June P. Anderson, a resident of the Sugar Creek Care Center in Normal, IL, formerly of Aledo, IL died Friday November 9, 2018 at Sugar Creek. Services are 11:00 a.m. Saturday November 17, 2018 at Fippinger Funeral Home in Aledo. Private burial will be in the Pleasant View Cemetery in Kewanee. There is no visitation. In lieu of flowers, memorials may be made to College Avenue Presbyterian Church. Online condolences may be made at www.fippingerfuneralhome.com. June Elizabeth Ponte was born September 11, 1925 in Kewanee, IL to Charles Glen and Frances Hayden Ponte. She graduated from Alpha High School in 1943 and attended Western Illinois University where she was a member of Pi Kappa Sigma sorority. June married Duane E. Anderson August 23, 1944 at the home of the bride’s parents in Alpha, IL. They moved to Aledo, IL in 1954. He died in 2005. She was a member of College Avenue Presbyterian Church since 1954, having served on numerous committees. She helped organize and charter the Alpha American Legion Auxiliary #1197 and served as its first president. She volunteered for many years at the Red Cross Blood Draw and the Mercer County Hospital Auxiliary gift shop. Survivors include: two sons: Brent D. (Cathy) Anderson of Bloomington, IL; Bradley C. (Sandra) Anderson of Plainfield, IL; grandchildren, Kyle (Christina Nichols) Anderson of St. Paul, MN; Dr. Brian (Dr. Yanhui Hu) Anderson of Libertyville, IL; Kent (Arianne) Anderson of Normal, IL; Joni (Robert) Sherman of LaGrange, IL; Jill (Brian) Tweedie of LaGrange, IL; 10 great grandchildren, Maya and Katherine Anderson, Avery, Olivia and Keaton Anderson; Andy and Ben Sherman; Elizabeth, Charles and Margaret Tweedie. She was preceded in death by her parents; husband: Duane; and two brothers. The family would like to thank the caregivers at Sugar Creek Alzheimer’s Special Care Center, Normal, IL for their excellent care and kindness during June’s final years.